Another date night in our kitchen, but I'm still doing all the work since Jon is still in his cast. Only 5 or 6 more weeks until he goes back to cleaning up after me! I felt like making risotto tonight. I love making risotto and am always looking for new flavors to add. 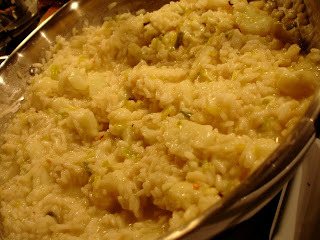 After browsing through recipes, I decided on Cauliflower and Leek Risotto. I didn't follow this recipe, but I did use it for inspiration. 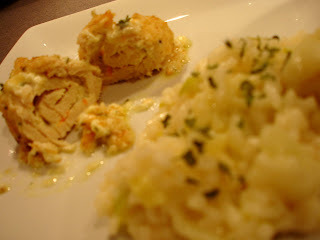 I served it with Boursin Chicken, a recipe I adapted several years ago. I need to do some research on where I found the original recipe so I can post it here. 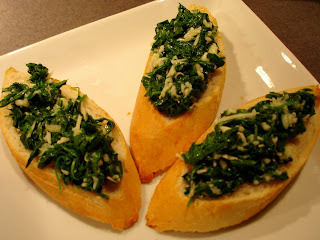 I also tried a new appetizer tonight - Arugula Bruschetta. Make toasts: slice bread, spread olive oil on one side, rub with garlic clove, heat in a 400 degree oven until crispy. Heat olive oil in a large pan. Saute garlic 1 min. Add arugula and saute until wilted, approximately 2 minutes. Drain off any excess water. Allow to cool to warm. Add cheeses, salt, and pepper. Top each toast with some of the arugula mixture. This was good but I think it was missing something. Next time I may use a creamier cheese in the mixture. I also may add chopped roasted red peppers or chopped tomatoes. Melt butter in a large saute pan over medium heat. Add cauliflower and leeks. Cook for 1-2 minutes. Add garlic. Add rice and toss until fully coated, approximately 1-2 minutes. Add white wine and stir until fully absorbed. Add warm chicken broth one ladle at a time, letting it absorb fully before adding more. Repeat until you have used all but one ladle of the broth and rice is tender. When you add the final ladle of the broth, also add the cheese. This is my trick for creamy risotto. Also add the spices at this time. This risotto was so delicious! My additions of garlic, cheese, and red pepper flakes were perfect. I would definitely make this again! Mix the boursin cheese with the grated carrots. You want this mixture to be creamy, so slowly add olive oil and stir. Spread a thin layer of the boursin mixture on each chicken breast. Roll them up and close with a toothpick or twine. You can prepare the breasts up to this step and then refrigerate them. When you are ready to bread and bake the chicken, mix the breadcrumbs with the parsley. Dip each breast in the melted butter and then roll in the breadcrumb mixture. Bake on 400 for 25-40 minutes, until chicken is done. I absolutely love the flavor of this chicken! The cheese oozes out of the crispy chicken and makes a great sauce. 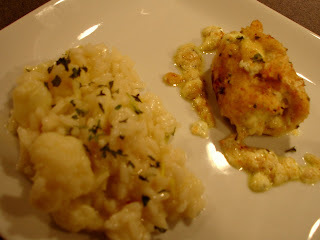 I was pleasantly surprised that the chicken went perfectly with the risotto as well. We enjoyed tonight's dinner with a 2002 Heitz Cellars Cabernet Sauvignon. Jon had this at the Capital Grille once and finally found it at a wine store in New Jersey for $49. It was very full but not too heavy or strong at all like some full wines can be. We loved it and will give it a great review in our wine journal.